During a trip to the USA in August, I drove 90 minutes from Chicago to Racine, Wisconsin to visit the SC Johnson Wax Headquarters. 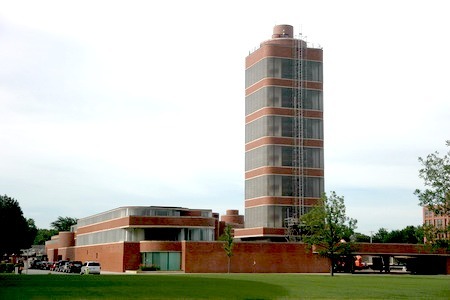 The industrial campus has been famous for the Frank Lloyd Wright designed Administration Building and Research Tower which captured architectural inspirations since the 1930′s and 1950′s respectively. A recent addition to the place is the Fortaleza Hall designed by Foster + Partners. Opened in 2010, the hall presents to visitors items related to the Johnson’s Family and their business philosophy. Together with the facility building featuring curved corners behind, the new complex houses staff facilities such as dining, banking, a fitness centre and a library / reading room dedicated to Frank Lloyd Wright’s architecture. Arriving early in the morning, I checked into the visitor centre underneath the Golden Rondelle Theatre. The theatre itself has an interesting history. The UFO-shaped theatre was originally designed by Lippincott and Margulies as the futuristic Johnson Wax Pavillion for the 1964-65 New York’s World’s Fair. After the fair, it was dismantled and brought back to Racine. Taliesin Associated Architects, who were students of Frank Lloyd Wright’s architecture school, was commissioned to redesign the structure to complement Wright’s buildings nearby. The result is a structure with shapes and colours which reminded me of Wright’s Gammate Auditorium at Arizona State University I visited a week earlier. I booked in for two tours, one to the Fortaleza Hall and the other to the Administration Building. These tours are available free of charge to the public, following this link to reserve your place if you can fit this into our trip to America. We were then lead to the glass cylinder appearing to support the circular plate roof with ten thin columns. The central exhibit is the Carnaúba Airplane built by Sam Johnson during the 1990′s. It is a replica of his father’s old aircraft which flew to Fortaleza (Brazil) in the 1930′s to source an important ingredient for the major product of the company. With this new plane, he and his two sons followed the exact route in a late 1990′s expedition. After Sam’s death in 2004, the family decided to build the hall with the aircraft as the focus. It is hung from the roof and appears to be taking off from the hall. The interior of the hall is minimalist, with a void looking down to the basement level accessed through two grand circular staircases. Between ground and upper floor is an open staircase over a reflecting pool, as one goes up, there is a soil-free vertical garden with South American native plants to the right. The upper floor dining area features a balcony with a gentle curved shape leading everyone’s eyes towards the focal point. Unfortunately we were not allowed to take interior photographs, but interior photographs are available from Foster + Partners’ website. After a short break we headed off to the Frank Lloyd Wright designed buildings. As the Research Tower is now closed to public, we were only able to see it from the outside. It opened in 1950 and is one of the tallest buildings ever constructed on the cantilever principle. The central concrete core supports all the floors alternating between a circular and square floor plates. 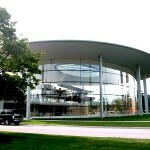 Like the Administration Building, the windows were formed from Pyrex glass tubings. The research team used the building for 30 years but their requirements for space outgrew the building in the late 1970′s and they had to move to a larger premises nearby. Under the current fire regulations, the building in it’s current form cannot be used due to the lack of a second fire staircase, however, it remained a symbol of the company and continued to be lit at night like a lighthouse. 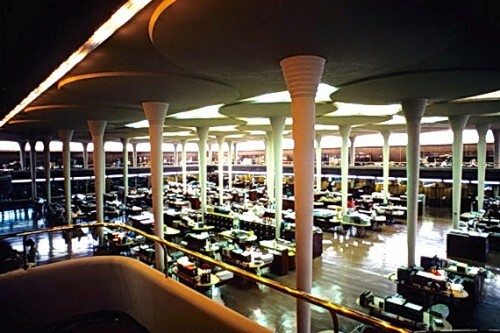 The Administration Building was designed by Frank Lloyd Wright to be a “Centre of Creativity”. 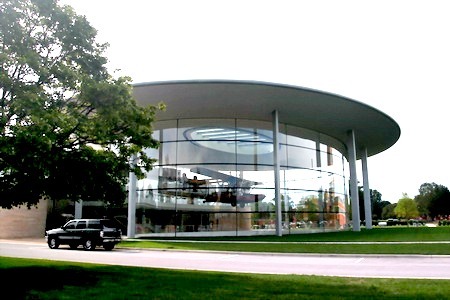 The most famous detail of the building is the mushroom-like dendriform columns supporting a circular plate. The gaps between these plates were filled with Pyrex glass tubings to act as skylights. The filtered light through these tubes produces a well lit interior most of the time so that the employees can work in this open office arrangement without the need of artificial light. The building is 70 years old but it still functions well despite the dramatic change in office environment since its opening. Looking at the group of buildings above, I believe Foster + Partners has produced a great design to add to the existing world famous architecture on the campus. 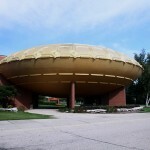 The circular floating plate roof is a tribute to the Wrightian column top in the Administration Building. 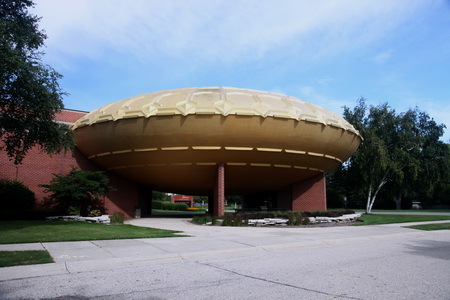 All the curved corners of the facility building are apparently drawn from the Research Tower while the overall circular shape of the hall works well with the The Golden Rondelle Theatre. This is an exceptional example of designing contemporary architecture to fit in the immediate surroundings without mimicking the neighbours.